Paddle Palace is mourning the passing of Les Sayre. Les was a long-time friend and co-worker, and he is sorely missed. He died peacefully in his sleep on Sunday, April 13 at the age of 78. The cause of death was cardiac arrest and congestive heart failure. See bottom for details about a memorial service. It seems that I have always known Les. When Les lived in California and I was a junior in the 1960’s and 70’s, our family drove to tournaments all over California and Les was there, always a friendly face. Les has shared many many stories with us from his young and crazy days in California, about playing Erwin Klein, Bernie Bukiet, Bobby Fields, and Stuffy Singer. I got to know Les well when he lived in Oregon and played at the original Paddle Palace Table Tennis Club in downtown Portland. He gave many of the top players a tough game and was certainly top-ranked in his love for the sport. While working at Paddle Palace, Les continued his volunteer work with the Summerfield Senior Center and Tigard HS as long as he could. Despite additional knee surgeries, cataract surgery, and even open-heart surgery, Les had twice as much energy as anybody. Les loved the sport so much that he sat in a chair when he couldn’t stand upright to play. 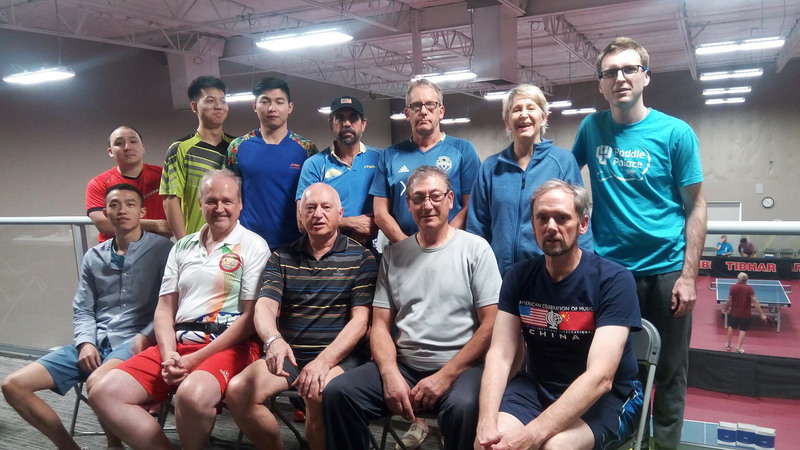 Les may have been the oldest at Paddle Palace in calendar years, but he was the most youthful in his approach towards life. He was always smiling, laughing, and enjoying jokes. Every holiday he had a special hat or costume to wear, and he often gave me thoughtful cards. Last Halloween a man in a monster mask showed up at Paddle Palace, unrecognizable, handing out candy. I was a little freaked out until I realized it was Les. Les loved working at Paddle Palace and it was a pleasure to work with somebody who so loved what he was doing. No matter what the task was, he was always willing to help. He took it upon himself to tend our small Paddle Palace garden and he had a serious “green thumb”. He brought plants for both outdoors and indoors and would argue when I reimbursed him for the cost. Les posted articles and posters on the walls of Paddle Palace, and he thoughtfully took photos when I was inducted into the Oregon Sports Hall of Fame and framed them. 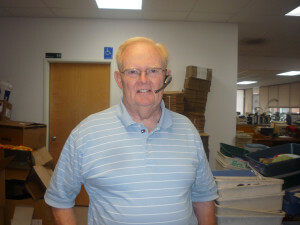 Les Sayre at Paddle Palace, wearing his headset. 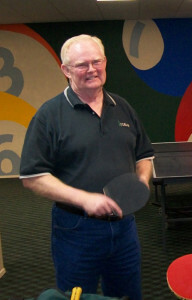 Les had a great collection of table tennis memorabilia, and he happily brought it out to share with walk-in customers. He had the long-handled wooden rackets from the “flim-flam” days, circa 1890, an original Parker Brothers ping pong set, and paddles from every decade. 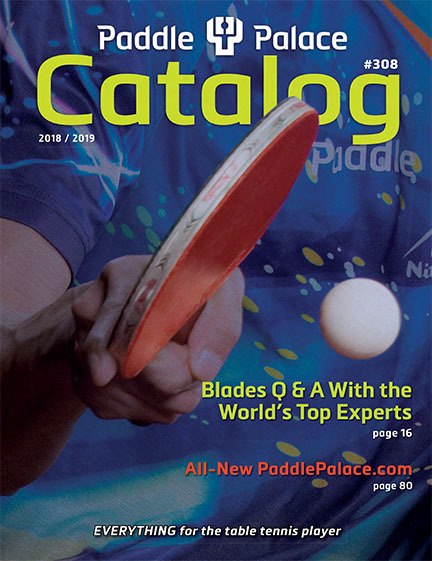 If somebody wanted information about any classic paddle, we forwarded them to Les. Les also liked to repair paddles. At no charge to the customer, he would take it home to fix in his shop on his own time. On the front of his desk at Paddle Palace Les hung a string of handles from broken blades. He would joke that each paddle owner insisted that the handle broke clean off without even touching it. Most of all, Les loved talking table tennis. He had customer friends from all over the country who called and always asked for him. Les would settle in, leaning back in his chair wearing his headset, and never tired of the continuous questions and discussion about products and the sport. Some of his lines are burned into my memory, such as, “How long have you been playing? Well, I’ve been playing for over 50 years…” He also liked to say, “I don’t care how good you are, just tell me how you play…” His headset was “glued” to his head, and frequently he forgot and wore it home. Many Paddle Palace customers are having a hard time because Les can no longer come to the phone. We still feel his presence here at Paddle Palace. He is missed but will never be forgotten. A Memorial Service for Les Sayre will take place on Sunday, May 18, 2014 at 2:00 PM at the Tigard Church of God: 15670 SW 98th Ave, Portland OR 97224. phone 503-639-4000. Donations may be sent to the church. Les was involved with providing low-income kids with a meal at the church on Wednesdays. Donations will go toward a larger van to transport them.